Our cattle spend their entire lives on prairie-like pastures. We are blessed with nutrient-dense soils, a diverse salad bar of grasses, and humanely raised British Breed cattle. The flavor of our beef is bright, robust, and tender; not dull or fatty. Click on Buying Direct for Q & A on purchasing our beef. We do not use hormones, pesticides, herbicides, insecticides, antibiotics, or synthetic fertilizers. 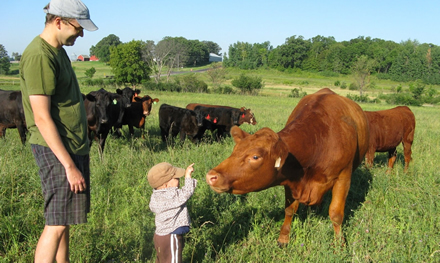 In addition, we consider our management plan beyond organic because we provide holistic care and concern for our cattle, our farm, our community, and our ecosystem. Buy Pasture Grazed beef direct from our farm and through Local Food Networks. Look for our beef at Hell's Kitchen, French Meadow, Corner Table, Broders, Lowbrow, Prairie Bay, Alma, La Ferme, DB Searle’s, Grain Bin, Cherry Grove, and other fine establishments. Our beef is skillfully processed in small batches by certified, family-owned processors in Central Minnesota. We distribute throughout Minnesota 52 weeks a year. Click ordering for placing web orders, packaging, pricing etc. Come say "hello" to our cows!